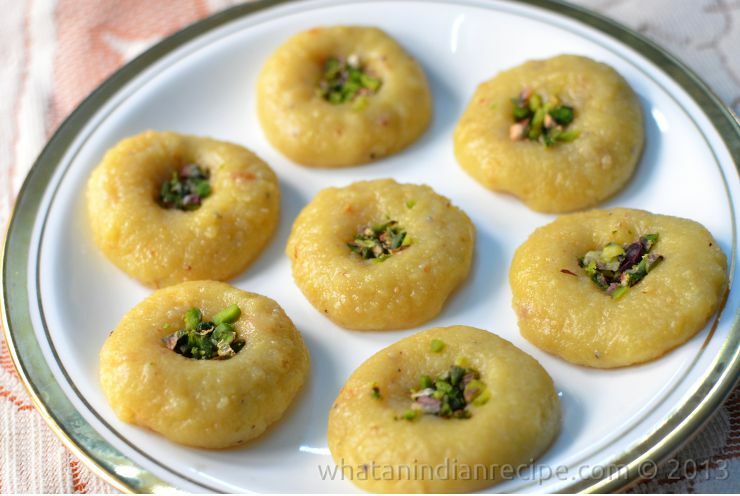 Mawa peda is made easily & can be stored for many days. Mawa is roasted with sugar & cardamom & then garnished with chopped pistachios. Enjoy this for Holi along with Thandai & Gujia. In a non-stick pan heat & roast mawa along with sugar till the sugar dissolves completely and the mawa changes colour slightly. The more you roast the mawa, the better the peda tastes, but take care not to burn it. Add the crushed cardamom seeds and mix well. Allow the mixture to cool and then make small balls out of it and shape them into pedas. Garnish with chopped pistachios in the center. Allow the pedas to set properly for some hours.